Picture a tiny school compound with 120 ish excited children, and some ridiculous dancing by adults in yellow T Shirts! 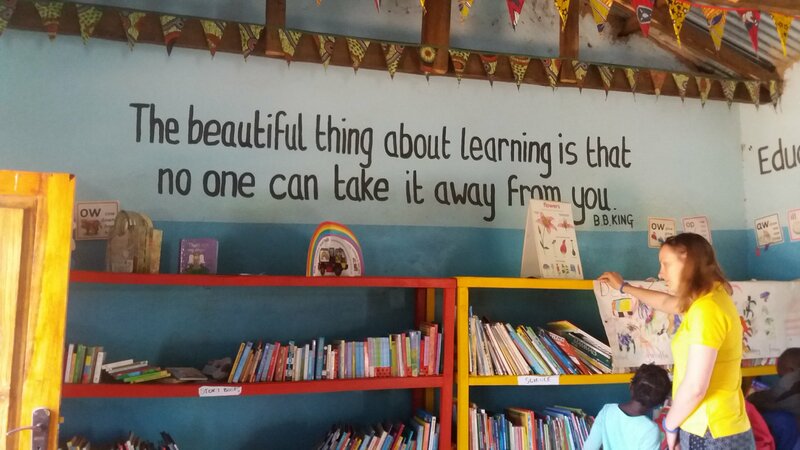 That was our farewell Book Bus reading session at Zwelopili Reading Room in Livingstone, Zambia, last Thursday. As well as our daily visits to schools each morning, we have been spending Tuesday and Thursday afternoons at libraries reading one to one with any children who turn up. This is one of the highights so far – in terms of the touristy side of things of course. We really were right at the top and stepping over that natural ledge, which you can’t see as it’s under the water, would take you over the edge of a 108 metre high waterfall. It did seem pretty surreal, but surprisingly safe, mostly thanks to our lovely guide O’Brian (seen at the back of the picture). His instructions were clear and precise, and we followed them implicitly. If O’Brian said swim up-river because the current is strong and will sweep you back towards the falls, we swam upstream. If he said hold hands in a chain, we did (we did a lot of hand holding!). If he said slide off this safe rock into a pool which doesn’t have anything between you and death, we believed him. The other guy taking the photos – well, he was actually walking along the very edge with 2 of our cameras, and it didn’t bear thinking about what would happen if he slipped. Anyway, it was a fantastic experience, and a lot of fun with 4 of my Book Bus friends. Safely back on Livingstone Island, we changed into dry things (in a changing room which strangely had no walls and was in full view of other folks eating their tea! – we improvised with lots of towels – and tucked into a gourmet high tea and a much needed G and T. The speed boat trip back to proper dry land, with the sun about to set, was pretty good too, especially as we were all still a bit hyper from the whole experience. It looks even scarier from th other side – if you zoom in you can see tiny figures on the edge! The Devil’s Pool trip starts at the Royal Livingstone Hotel, apparently one of those top hotels on lists of places to stay before you die. We whisked through pretty fast, but it did look beautiful. It also made me feel, once again, the inequalities here (and many other places of course). We had paid $140 each for our Pool trip. Many tourists here will do several trips, bungee jumps, helicpter flights, rafting, sunset cruises, etc. At one of the schools we visit, parents are asked to pay the equivalent of $30 per term, which means my afternoon trip would pay for about 18 months education for a child. And seeing the luxurious Royal Livingstone, is such a contrast to some of the housing we see on our way to schools. 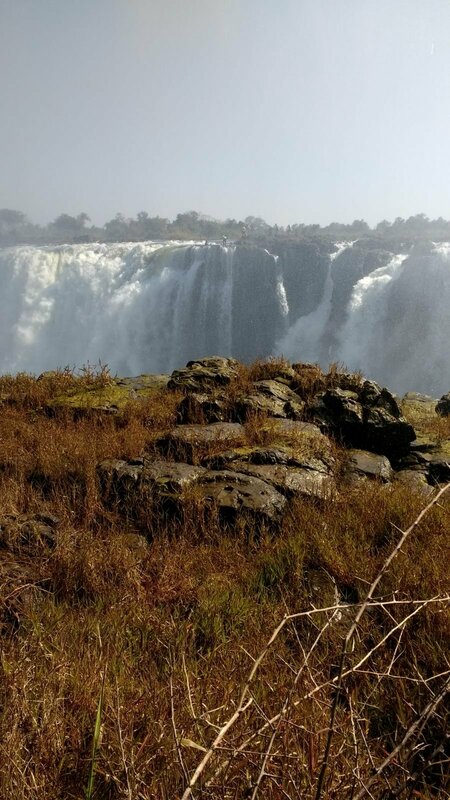 Many kids around here have never seen the Falls, the largest waterfalls in the world, and the reason why most tourists are here. The Book Bus did take a group of kids to see the Falls a couple of years ago, which seems a vary fair thing to do. I know the local economy is based on tourism here, and if it didn’t happen many people would be without jobs and much worse off … but it just makes me think. Anyway, to the rescue comes the Local Cowboy. This was a bike tour that another volunteer and I did at the weekend, $25 each for a full 4 hour tour. These tours fund a community school that the organisation set up, led by Cowboy Cliff, at first under a tree, but now with buildings including a new classroom going up now. 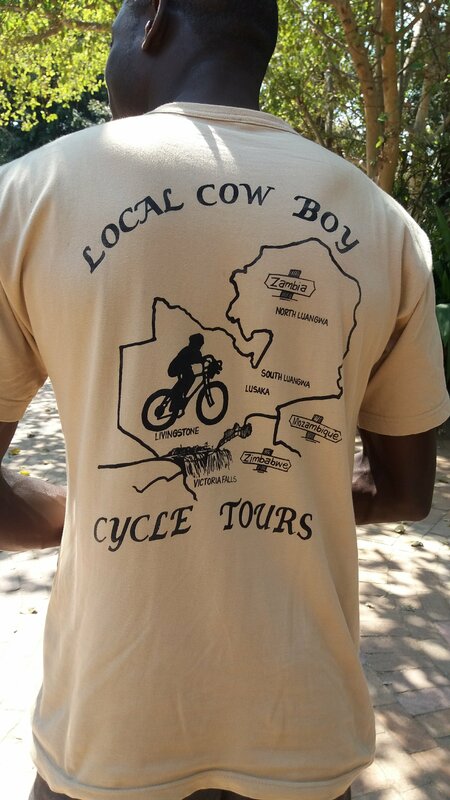 Our guide was fantastic, telling us as we cycled around so much about Zambian life. As Book Bus volunteers we see a lot more than the average tourist, but we learnt a lot more. He took us through a village where he poorest people make their living from breaking stones from a shallow quarry, and met a lady of 82 who still does this work – at the Southwell Workhouse back in Notts, this is one of the demeaning jobs we display, that inmates were forced to do. But the village has a school, and running water and electricity for the few households that can pay. Another village was much more prosperous and middle class, with larger houses, and power and water to every house. 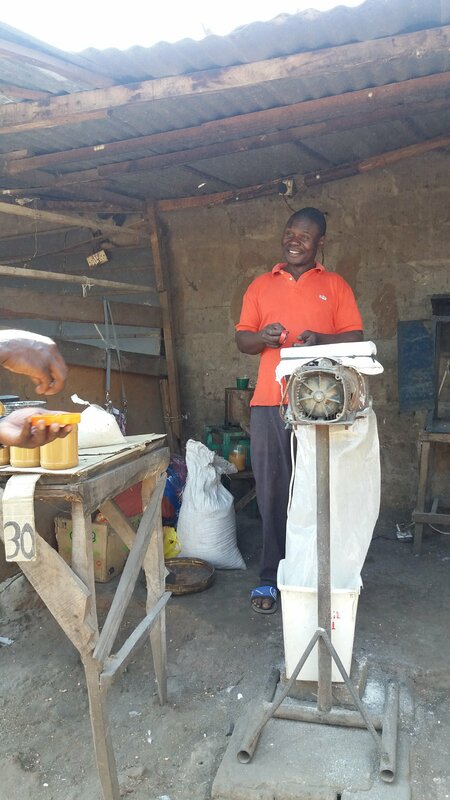 Then there was the market, full of locals buying and selling, a peanut butter making stall, a corn grinding stall where you take yor own corn to be milled. 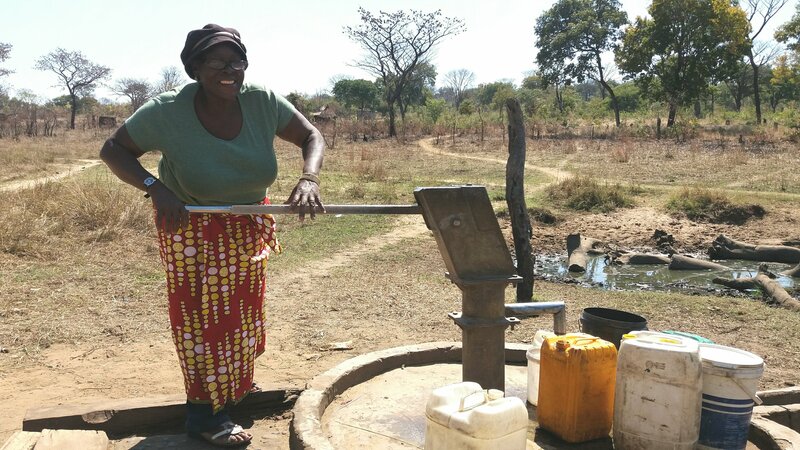 Annie shocked a stal holder by buying hand carved wooden spoons for her husband, who is a great cook – but by Zambian standards that is all wrong. Even our young guide seemed a lttle surprised! Our final stop was at the school we were helping to support, where 200 children from Grades 1 to 6 are taught, with Grade 7 coming when the new building is finished. Parents agreed at a meeting when the school started how much to pay, but vulnerable kids go free. 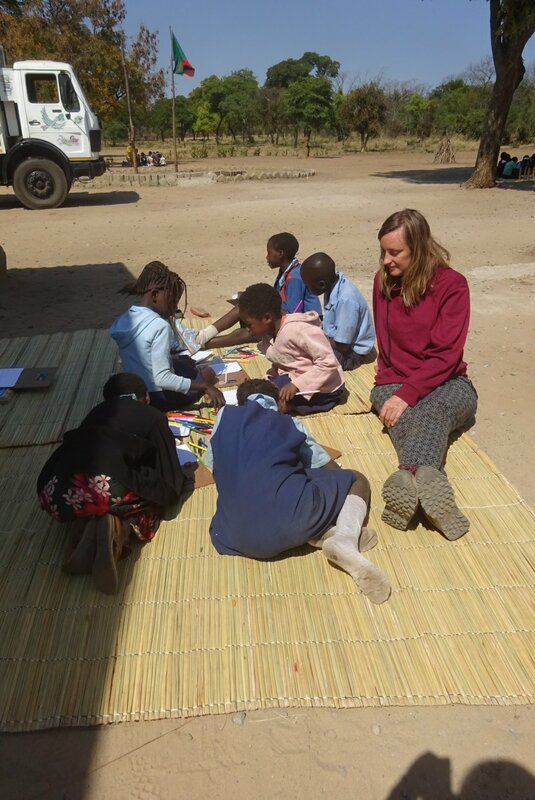 So it is now school holiday time here in Zambia, which means us carrying on working, but doing holiday clubs instead of school time sessions. These are voluntary for the kids, so unpredictable numbers, and more flexible planning. It is also variable between schools. 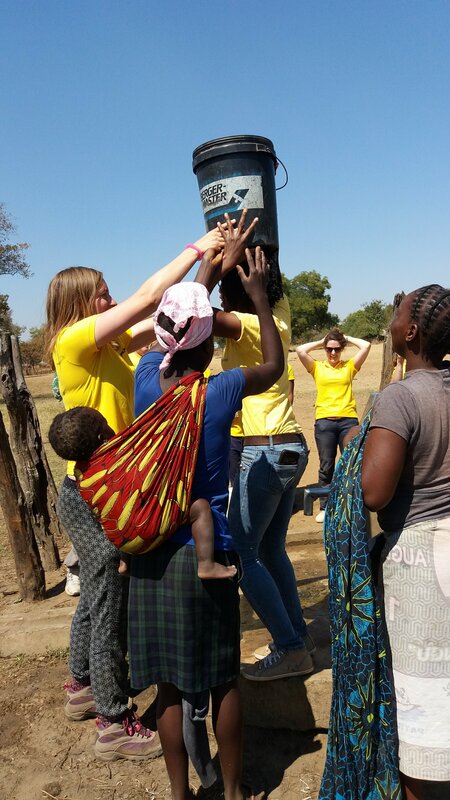 At Zwelopili, a community school in a built up area on the edge of Livingstone, we arrived to find masses of children! I was in the “baby” group with 3 other volunteers, based inside the Reading Room (the Book Bus Library there), with abut 50 children, and baby is not far off the mark. As well as the Grade 1 and 2 pupils, there were toddlers, babies carried on the backs of tiny but walking sisters, and a fair amount of chaos. We did 2 sessions of Going on a Bear Hunt, with lots of actions and teddy bears to colour. and survived. Repeat next day with similar numbers and different books. Then we had 3 days, 2 different schools, a bit more remote, where numbers were lower. On Thursday, our group was just 5 Grade 4s, with 2 volunteers and the head teacher of the school to translate – which made the kids very quiet and shy as I think they are in awe of her! But we could do a lot more one to one, checking their understanding, and really doing some in depth work, which with 50 is obviously not quite so easy. 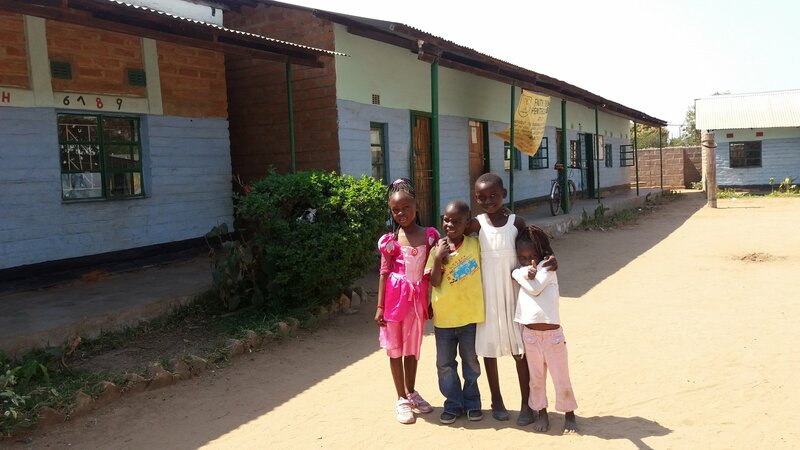 We have met some really inspirational Zambian people in schools. All the staff in the schools and libraries we have been to are so incredibly grateful, and yet we are only spending a few weeks here, and enjoying a holiday while we’re here, and then going back to our own relatively priviledged lives. They work here all year round, and achieve amazing things for some very vulnerable children. Like Teacher Ann, the head at Kamatanda School, a long drive out into the country from Livingstone. A retired teacher, she set up a school for the community 5 years ago, under a tree, and now has 3 good buildings on the site (including a new library), as well as running a feeding programme, which gets kids to attend, as well as helping the families. 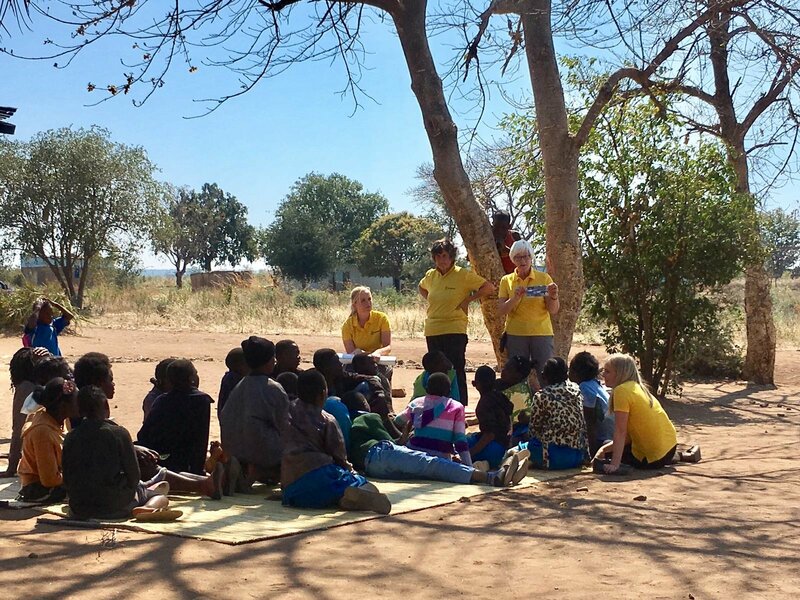 Parents pay 15 Kwacha a month which covers materals and salaries (when there is enough money – many teachers in community schools are volunteers). 15 Kwacha is about 1.50 pounds. We met a family nearby, and the son was one of Ann’s first class. Now 18, he is at secondary school in Grade 8, and aims to be an engineer. 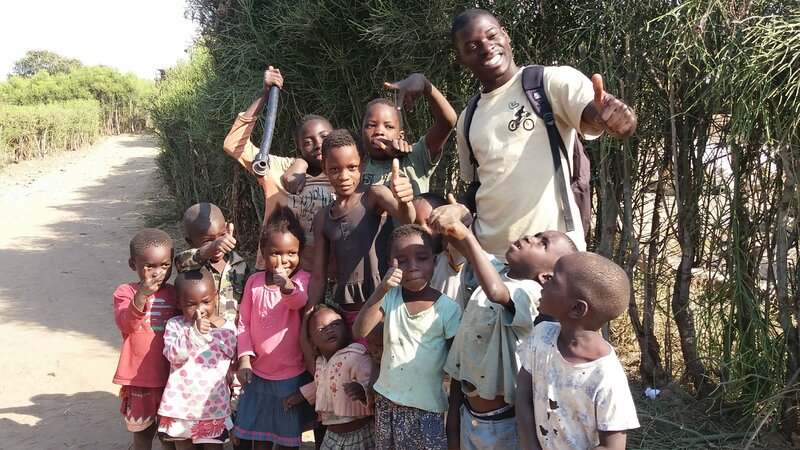 Without Kamatanda School he would never have been to school as there is nowhere else nearby. Kids walk up to 5Km to school, and are taught in 2 shifts – some 7AM till midday, others in the afternoon. And then at Zwelopili (where there is also a Reading Room, i.e. Library – please take note, UK schools who are closing their libraries!) the founder of the school recently died. His brother came one day to thank us for our work, and his niece and nephew Claudia and James work as vounteers at the Reading Room. Claudia told me that the school’s future is in doubt now, though they will do everyhing they can to carry on. It is a tiny school, with 120 ish kids from a poor area, with no water or electricity – but lots of enthusiasm! 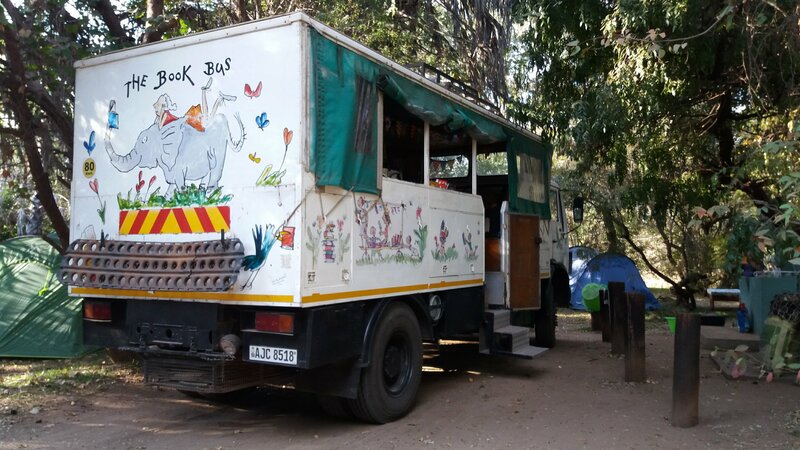 And then we have the Book Bus staff, Bwalya (who does a great job organising and looking after us), Rachael (who does everything around the camp and in schools with us) and Edward (our driver – also brilliant at spotting interesting animals on the way to schools). They work hard with no time off, and give us all the support we need, and after 2 weeks feel like real friends. 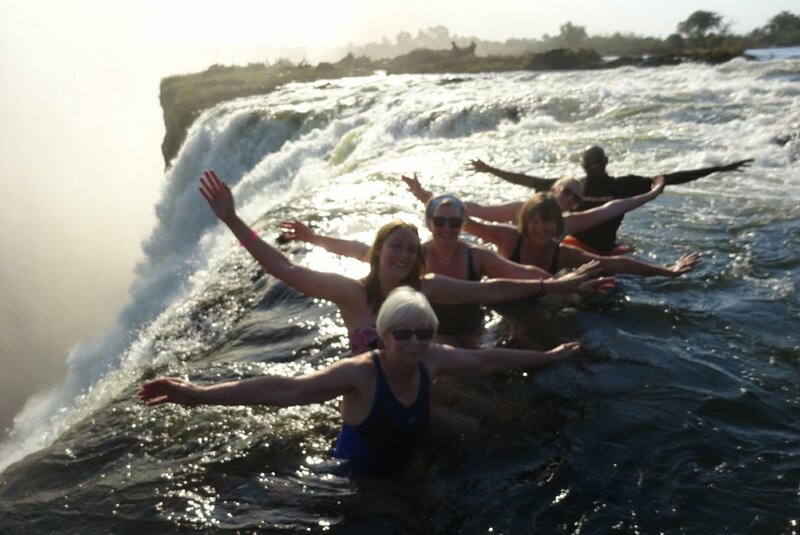 It isn’t all hard work, and I’ll put more about our extra curricular activities in another post – but highlights this week have been swimming at the Devils Pool, i.e. 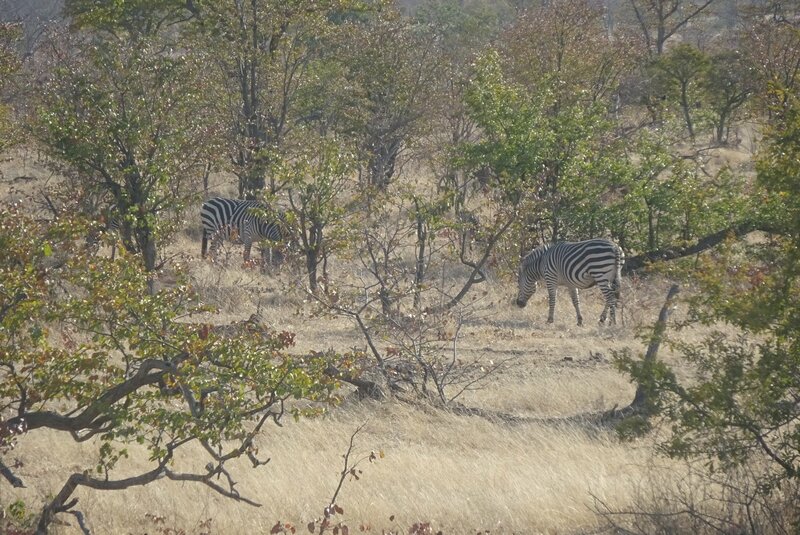 at the very edge of the huge Victoria Falls, and seeing elephants, zebras, a giraffe, and impala on the morning commute. So, my first week is done, with visits to 3 schools and one library session. One school, Chilileko, had 3 visits, which is good as you start to get to know the children, as we take the same groups each time. Chilileko was where I got the kids writing and drawing postcards, which went really well with Grade 6 and OK with Grade 4. They were fascinated with my photos of home I’d brought out – I was really trying to show them pictures of Nottingham, but they loved the ones of my family, especially me dwarfed by my tall husband and sons. Here I am demonstrating the concept of a postcard with the British royal family – the only postcard on the bus! I’m not finding much time to blog, as we are pretty busy – yesterday was 2 sessions at one school plus a library visit in the afternoon, back to base at 5, planning for the next day… and it gets dark at 6! So here I am at 7AM sitting in the campsite bar (at the best table for wi-fi!) by the beautiful Zambezi River, with spray from the Vic Falls in the distance, feeling decidedly chilly in my fleece. Gloves maybe would have been a good idea! Well, I have arrived at Livingstone, and am settled in at our camp. it is beautiful here, by the Zambesi River. We start in our first school tomorrow, and had a briefing from Bwalya who is in charge here. Nearly ready for the off, I’ve been doing a dummy run of packing – don’t want any last minute panics on Friday morning when I find it won’t all fit!